I enjoyed a sunny day down at Bodiam yesterday. I made a return visit to complete a painting I started last Saturday. 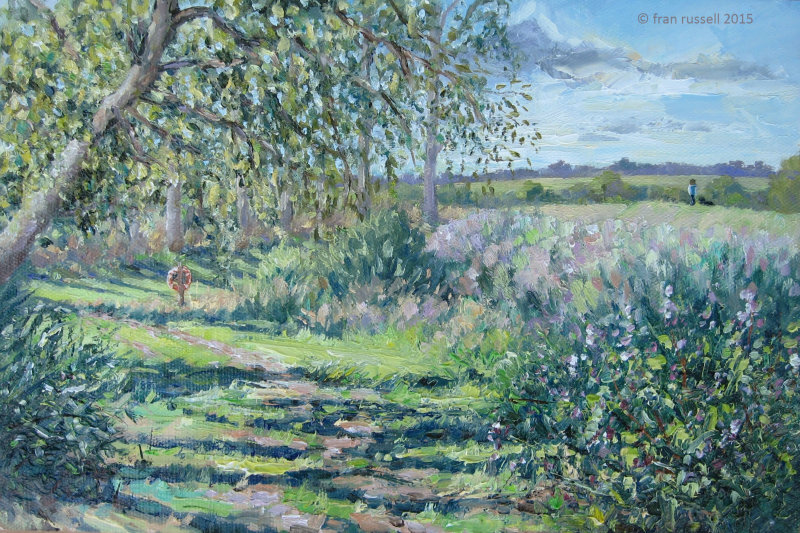 I positioned myself on the riverbank between the river (the plants are so tall you can't actually see it) and the campsite, run by Nick and Anna Eastwood from The Original Hut Company - who kindly allow me to paint there. It's a great place for a glamping holiday. Last weekend I met a large group of friends who were there for a 40th birthday celebration and yesterday I had the pleasure of chatting with a lovely group of gals down from London enjoying a hen weekend. I always feel totally comfortable painting at Bodiam. it's a beautiful place with a wonderful vibe. I went on to complete a 2nd very small painting (turning my easel 180 degrees and moving it around 6ft down river, looking towards Bodiam village). Another lovely day!